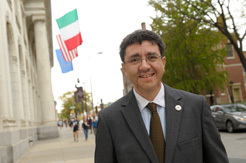 Consul General Andrea Canepari was born in Pavia. He graduated with top marks in 1996 from “Bocconi” University in Milan with a degree in Economics and in 1998 from the University of Parma Law School. In 1999, he completed a Master of Law, L.L.M., at the University of Pennsylvania Law School while on a full merit scholarship awarded each year to only one Italian lawyer for academic excellence by the “Fondazione Gianani – A.B.I. (Italian Bankers Association). From 1996 to 1998, he also completed a teaching fellowship at the Comparative Law Institute of the “Bocconi” University in Milan. He joined the Italian Foreign Service in 1999 and was appointed Section Head of Cyprus, Greece and Turkey and subsequently Section Head of the former Federal Republic of Yugoslavia and Bosnia-Herzegovina. He was posted at the Embassy of Italy in Ankara, Turkey, from 2002 to 2006, first as Head of the Consular Chancery, then promoted as Head of the Economic and Trade Office when Italy was Turkey’s second trading partner. From 2006 to 2010, he was posted at the Embassy of Italy in Washington DC as First Secretary for American Politics and Relationships with the US Congress and then First Secretary for Political Affairs. In 2010, he returned to Rome as Counselor and Diplomatic Advisor to the State Minister within the Italian Presidency for the Council of Ministers (the Italian White House). Upon completion of these duties, he assumed the position of Alternate Director of the North America Division, Political Affairs and Security Bureau, at the Ministry of Foreign Affairs. Andrea Canepari was the Founder and former Chairman of the Washington DC branch of the Association “Alumni Bocconi” from 2006 to 2010. He was also the founder and former chairman in 2005 of the Ankara Chapter of the “Italian Academy of Cuisine”. His decorations at the international level include: Knight of the Order of Merit of the Italian Republic, Knight of Magisterial Grace, Order of Malta (Sovereign Military Hospitaller Order of Saint John of Jerusalem of Rhodes and Malta – SMOM), one of the oldest institutions in the Western world at more than 900 years ago and a sovereign entity subject to international law; and the EUFOR LYBIA CSDP Service Medal for Planning and Support. He received several awards, citations and over 50 mentions in the last 2 years in the press, TV and radio for raising awareness about Italian cultural contributions to the Mid-Atlantic Region, highlighting the success of the Italian-American community, promoting a new image of Italy and supporting concrete initiatives to further strengthen the links between Italy and this region. A passionate supporter of the bridge building between the Philadelphia region and Italy and European Union, he has served on numerous committees, including the Papal Event Committee and the Heart Ball Executive Leadership Team. Andrea Canepari is co-editor, with Prof. Luca Molinari, of the book published in 2007 by Skira entitled “The Italian Legacy in Washington DC: Architecture, Design, Art and Culture”, with an introduction by former US Speaker of the House of Representatives Nancy Pelosi. He was appointed Consul General of Italy in Philadelphia on August 26, 2013.